Is Internet Explorer 9 right for you? In the web browser wars with Google Chrome and Mozilla Firefox, Microsoft have focused on further improving performance, security and usability of their flagship web browser. Once you look through this article you are able to make an informed choice on whether moving to the new version of Internet Explorer is right for you and your family. IE9 only works on Windows Vista and above. If you are still on Windows XP, you Will Not be able to use IE9. Microsoft's view seems to be that Windows XP cannot enable IE9 to perform to the expected standards for it to be competitive with rival web browsers. Windows XP lacks certain technical capabilities that later operating systems have to handle the increasing number of interactive and multimedia web sites that are emerging on the Internet. If you are a Windows XP user, you can still move to Internet Explorer 8. If you haven't already, take a look at the IE8 tutorials. The features discussed in the IE8 tutorials are also available in IE9. Windows XP has gone End of Life (EOL) on April 8th 2014. This means no further security patches or Service Packs for this Operating System! Windows 10 is to be released in 2015. After moving to Windows 7 it is worth waiting to see what Windows 10 brings before deciding to move to this latest version. Listed in the Table of contents is a link to each feature that is discussed. This gives you the option to either read through the whole page, or hop to the feature of interest. Step 10 gives you the opportunity to share your thoughts and experiences on how you would improve this version of Internet Explorer. 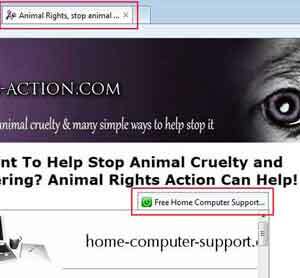 Have you used other web browsers such as Google Chrome? What is better about other web browsers that Microsoft should consider including in future IE releases? Step 11 enables you to jump directly to the thoughts and ideas shared by other visitors to this web page. Take a look. You may find out something new! 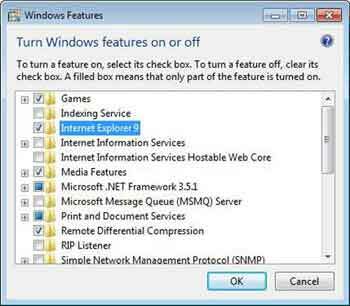 If you are a Windows 7 user and don't have the IE9 Explorer setup, follow the basic steps below. 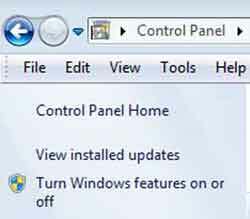 Left Click Start > Control Panel > Programs and Features. Then left click the Turn Windows Features On or Off link at the left hand side of the screen. Put a tick on the box for IE9 to enable, or untick to switch off. Click OK for the operating system to install and setup. The next step in this article is to provide you with an easy to follow review of the new IE9 features. The biggest change is performance. It reportedly loads much faster than IE8 and 'hardware acceleration' (discussed above) means web pages load faster in new tabs. The IE9 review by PCMag.com (Opens New Window) compares performance against other competitive web browsers. It gets quite technical, but take a look if you are interested. There is quite a change with the IE9 user interface i.e. what you see when you load Internet Explorer up and start using it. The IE9 User Interface has much Less Detail! Gone is the search bar (more on that below) and the tabs are now on the same row as the address bar. The menu options (File, Edit etc.) are now placed below the address bar. The Back/Forward buttons are also enlarged. This lean setup increases the space to view your web pages. The Search Bar and Address Bar are now combined. The single address bar search displays the web page address as usual. This new feature is displayed as a bar at the bottom of your browser. It is discreet but noticeable. You have the option to run your download or save it to a specified location. 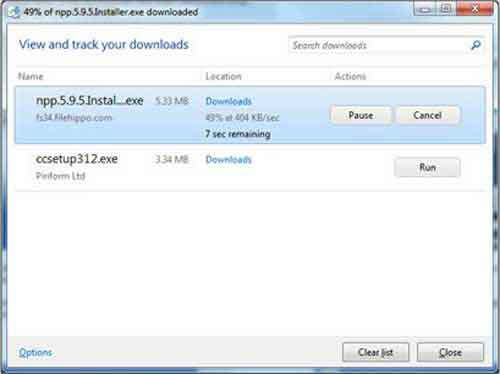 It also scans the download for any malicious content, further protecting you and your family. You can also View and Track Your Downloads, and Pause/Resume your downloads, if required. When you open a new tab, it displays the most frequented web sites for quick and easy web browsing. You can also Tear Off Tabs to put web pages in their own IE9 window. It is now possible to tear-off tabs (as described above) and 'pin' them to the taskbar, just like an application. When you open the web page from the taskbar icon, IE9 adopts the colours of the taskbar icon (known as the Favicon). The Internet Explorer 8 tutorial discusses the fact that too many toolbars and extensions slow down your web browser. The Performance Advisor shows the load time of each add-on to help you decide which one is causing your web browser to slow down. Simply disable or remove the add-on with high numbers e.g. 4.06s. Tip: If disabling or removing add-ons does not fix your performance issues, shutdown your anti-virus and anti-malware applications, then close down all Internet Explorer windows, and open up again. If the performance issue is fixed, try re-installing or updating your security software. If you are running Windows 7, I recommend upgrading to Internet Explorer 9. You can do this be either clicking on the Microsoft Internet Explorer Web Site (Opens New Window) or via the Windows Update Option. Microsoft made significant improvements at the time to make Internet Explorer 9 more competitive with rival web browsers. However they continue to lose market share as Chrome and Firefox dominate. In Windows 10 Microsoft are considering discontinuing IE and re-launching a re-branded web browser called Spartan (Opens New Window). Windows 10 is not released at the time of writing so it should be interesting watching what Microsoft decide to do. What could Microsoft do to enhance Internet Explorer in areas where you feel it is lacking, and compared to other browsers such as Google Chrome, Mozilla Firefox, Opera etc.? Enter Your Title e.g. "Better Parental Controls"
Your views will appear on a Web page exactly the way you enter it here. You can wrap a word in square brackets to make it appear bold. For example [my story] would show as my story on the Web page containing your story.